I love coming up with new activities that promote a balanced lifestyle and healthful choices! Today I want to share a few activities that make the most of the brand-new Steps of Health floor decals that just made their debut in the Nutrition Education Store. Their possible uses are endless, and these brand-new floor decals also come with a handout that details how those eight elements can help improve health. There’s even another handout that highlights some fun activities that are perfect for these materials, and that’s the handout I’d like to share today. Arrange the feet so that they appear to be a trail across the front of the room, leading from the door into the classroom. As people enter your classroom, have them walk the trail and note what is on each footprint. Once everyone has walked the trail and then found a seat, explain that each person can now brainstorm a few ways to implement each element of the path to good health in their own lives. Have all the participants use a piece of paper and a pen, then divide their page into eight sections, one for each footprint. Let them give each section a title (“Move More,” “Fruit,” “Vegetables,” etc), then allow everyone some time to brainstorm while you re-create the grid of eight footprints on a whiteboard or large piece of paper that you have posted at the front of the room. Once everyone appears to be done brainstorming on their own, bring the class back together and have people share what they wrote. Write the ideas down on your own board and encourage everyone to add ideas to their own sheets if the new options resonate with them. These decals make excellent decorations for a health fair booth. Consider using these little feet to create a path to your booth from the entrance, or arrange them in an arc around your booth so that people can make a full circuit of what you offer. These creative materials are sure to help your booth stand out from the crowd at the next wellness fair. These stickers don’t have to stay on the floor! 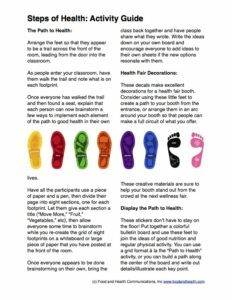 Put together a colorful bulletin board and use these feet to join the ideas of good nutrition and regular physical activity. You can use a grid format à la the “Path to Health” activity, or you can build a path along the center of the board and write out details/illustrate each key point along the sides of each foot. Here’s a printable handout of these activity ideas. How will you use yours?